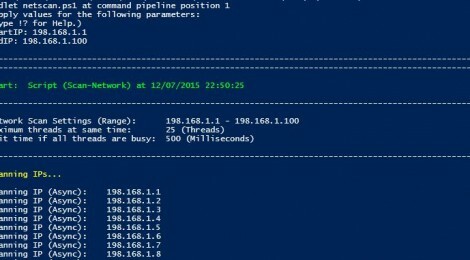 Browse: Home / Async IP-Scanner for PowerShell. Currently the first 3 quads of the IP-Address must be the same… you can only scan a range of /24. 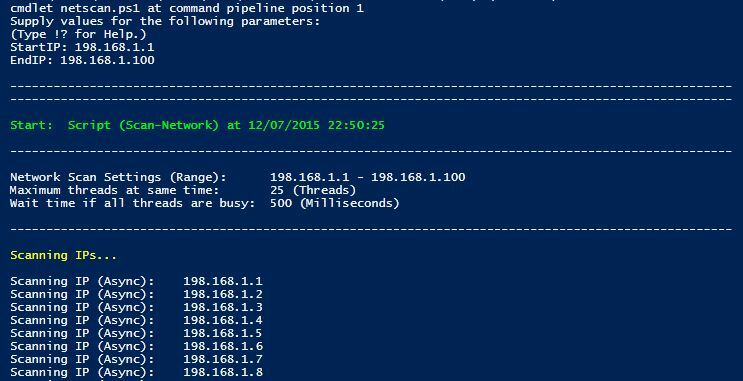 IP-Range include IP-Address, Hostname (with FQDN) and Status. I built this powerful asynchronous IP-Scanner, because every script i found on the Internet was very slow. Most of them do there job, but ping every IP/Host in sequence and no one of them could ping more than /24. don't need a subnetmask (for example 172.16.1.47 to 172.16.2.5 would work). IP in the parameter (use Get-Help for more details). like every other object in PowerShell. Last but not least: Have fun with it! Write-Host "Scan start for IP:`t$IPv4Address"
← JSQL Injection v-0.72 released : a java tool for automatic database injection.